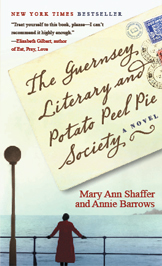 We couldn’t be happier to report that The Guernsey Literary and Potato Peel Pie Society has occupied the #1 spot on the New York Times bestseller list (trade paperback fiction) for three weeks and counting! Our congratulations go out not only to Annie Barrows and the late Mary Ann Shaffer, but to all of you, who have made this wonderful book such a success. The members of the GLAPPPS would be proud.